Are You Waiting for Mega Sale! Pakistan Resolution Day or 23rd March Sale 2019 is Here…!!! There are only two days have been left in Pakistan Resolution Day, as it is one of the most important day in the history of Pakistan. So on this special day all top brands of Pakistan are offering mega sale as Pakistan Resolution Day Sale 2019. Now Pakistani people can get more discount on all the top clothing and shoe brands of Pakistan. The top brands of Pakistan that are offering Pakistan Resolution Day Sale 2019 are Zelburry, Alkaram, Sana Safinaz, Kayseria, Tarzz, ChenOne, Warda, Gul Ahmad, J. Junaid and Bonanza. Make this special day more special by visiting the nearest stores of all these brands in Pakistan. There is a handsome discount on all the items there, so don’t wait more and go for shopping right now. The details about the discount offers and items related to Pakistan Resolution Day Sale 2019 are given below. Check the below section for more details. Zellbury Pakistan Resolution Day Sale 2019 offering 30% Off on selected outfits for men, women and kids. The mega sale is start from 20th March, 2019 till March 24, 2019. FREE Shipping is also available all over the Pakistan. Last year a mega sale was held named 14th August Azaadi Sale 2018 by major brands of Pakistan. Alkaram is offering Flat 23% OFF in Pakistan Resolution Day Sale 2019. This sale is started from 20th March 2019 to till March 24, 2019. You can avail Flat 23% OFF on clothing and accessories. Free shipping service would be provided on orders above PKR 3000/-. Another Pakistan’s top clothing brand Sana Safinaz is offering Up to 23% OFF on your favorite designs. The sale would be start on March 22nd 2019, to March 24, 2019 for limited time. Free shipping is available nationwide. Kayseria is here for providing FLAT 15% OFF in-stores & online from 21st March, 2019 in mega sale of Pakistan Resolution Day Sale 2019. This sale is available in-stores & online from 21st March to 24th March on ALL NEW ARRIVALS. Rs.100/- would be charged on Shipping (Nationwide). Sale would be end on March 24, 2019. The next top brand of Pakistan that is offering Up to 70% OFF in Pakistan Day Sale 2019. This sale would be start from 22nd March 2019. The customers can also avail some discounts in all Tarzz stores or online shop. Free Shipping would be done on orders of PKR.2500/- and above in Pakistan. 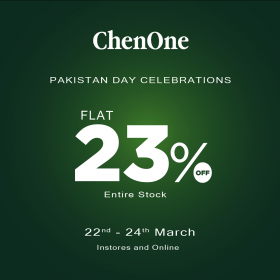 Celebrate the Pakistan Resolution Day Sale with ChenOne as there is FLAT 23% OFF on Entire Stock of ChenOne. The sale would be start from 22nd March 2019. The sale would be held till 24th March, 2019. You can visit in-stores or shop online also. Free Shipping service is also here for Above Rs.3000/- otherwise Rs.295/- will be charged. Warda is another top cloth brand in Pakistan, on Pakistan Resolution Day it is also offering Flat 23% OFF for Pakistan Resolution Day Sale 2019. The mega sale is started from 16 March 2019 till 24 March 2019. Sale is valid in-stores and online also. Free Shipping would be done on orders over Rs.1500/-. In the mega sale of Pakistan Resolution Day Sale 2019 Gul Ahmad is also here to provide up to 50% OFF on its items. The sale is started from 19th March 2019. Shop online or visit now the stores to avail huge discounts. Free Shipping is here across the Pakistan. In the mega sale for the special day, how it is possible that J. Junaid Jamshed would not be included. So, J. Junaid is offering Flat 23% Off on entire stock including all clothing collections, fragrances, makeup and accessories etc. The sale is start from 20 March 2019. Flat 23% OFF Discounts are also valid on kids wear. Free Delivery is available for all the orders above Rs.1500/-. One more top brand of Pakistan is here to provide up to 25% off in-stores and online on the occasion of Pakistan Resolution Day Sale 2019. You can enjoy up to 25% off in-stores and online from 20 to 24 March 2019. Sale is valid on limited stock.